When We Were Very Young and Now We Are Six complete the four-volume set of deluxe editions of the Milne and Shepard classic works. 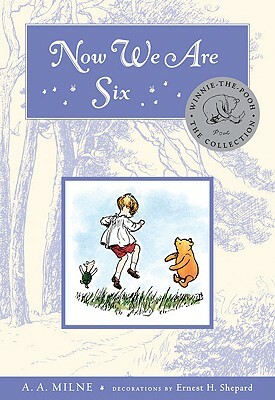 Like their companions, the Winnie-the-Pooh 80th Anniversary Edition and The House At Pooh Corner, these beautiful books feature full-color artwork on cream-colored stock. The imaginative charm that has made Pooh the world’s most famous bear pervades the pages of Milne’s poetry, and Ernest H. Shepard’s witty and loving illustrations enhance these truly delightful gift editions. A. A. Milne was born in 1882 in London. He was a playwright and a journalist, as well as a poet and storyteller. His children’s books were inspired by his son, Christopher Robin. Milne died in 1956. E. H. Shepard was born in 1879 in England. His pictures of the Pooh characters are based on real toys owned by Christopher Robin Milne. Shepard died in 1976.